Halva is a confection originated in the Balkans and eastern Mediterranean regions. It is made from ground sesame seeds, honey, and other ingredients such as dried fruit, pistachio nuts, farina (semolina), and almonds. The ingredients are blended together, and poured into bars or long loaves. Tahini (sesame cream), the basic ingredient of Halva, is an excellent source of protein (26%) and polyunsaturated fats (60%), is rich in vitamins and has traces of iron and magnesium. 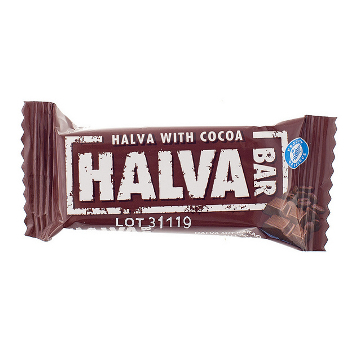 This variety of Halva is sweetened with chocolate. Crushed Sesame Seeds, Glucose-Fructose Syrup, Cocoa Powder, Palm Oil, Vanillin.